I had to post a picture of this lovely and thoughtful diorama that kissmeforlonger made me the other day. Sorry, the jelly set before I could stick the shrubbery in it. That's OK -- it looks lovely just as it is. *hugs*. It was great to catch up with you as it's been a while. kissmeforlonger could be one of the world's great food sculptors. I saw an amazing thing on PMTV where someone had made a scale model of New York out of biscuits - and Richard Madely ate one! God I hope voodoo doesn't work because he might come to regret that. I have another plan that's a lot more complicated and requires planning. Don't worry... it'll happen! Looks great :-) Did it survive the journey home?? I'm afraid to say it did not even attempt the journey home. 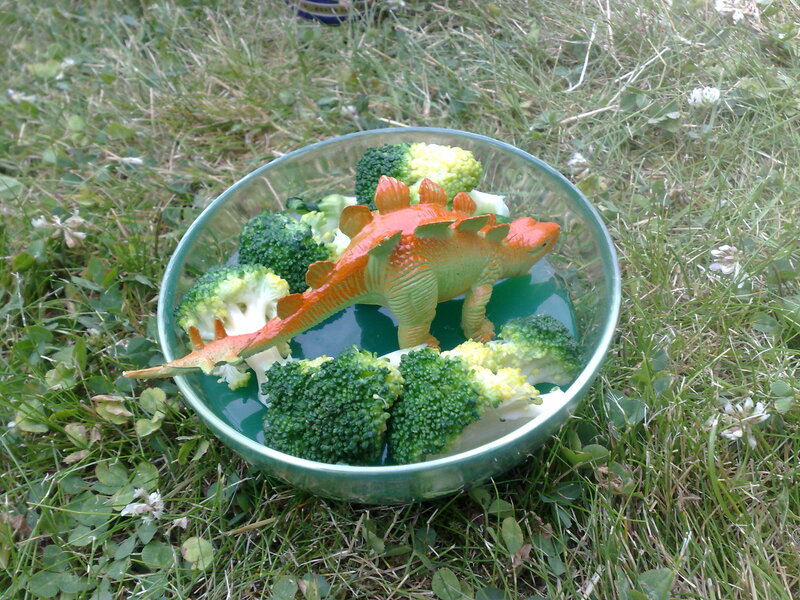 I thought that the combination of broccoli, jelly, dinosaur and hot poorly-driven van was a disaster waiting to happen so I left it at the BBQ for future generations to enjoy. Yes, so nice to see you, however briefly. Sorry if I was a bit stressed out. Driving really takes it out of me. That is truly awesome - my compliments to the... chef, artist? You know what I mean. Heh... I don't think there is a word for someone who produces artistic inedible food. Pah. You could have eaten everything except the dinosaur. I *could* have but you did tell me it would be horrible. Anyway, it was a very thoughtful gift -- and it made me laugh!